Bold Predictions for the MLB season. So Matthew Berry just released his “bold prediction” article (click the funny colored letters to read it) and it got me thinking of doing something a little similar (As you may know Berry is a sort of inspiration for the creation of this blog and my pen name). Instead of doing a player of each team I’m going to do a player by position. I will take a normal lineup (C, 1B, 2B, SS, 3B, 3 OF) and add 5 util players, a corner infielder, and a middle infielder . For the Pitching staff I will do 6 SP, and 4 RP. So I will have 25 Bold Predictions total. These won’t be backed entirely by facts, but instead guided by facts. These predictions are the things I feel at my gut. I will try to do some “negative” predictions too (this is a little harder for me to do, I’m usually very optimistic about everyone…except Jayson Werth that is!). These predictions will look a little different than my position predictions because they were just me stat crunching, these are my gut feelings for this season. Enough of me blabbing and on to the craziness that are my Bold Predictions. C-Matt Wieters will finally be the player so many scouts have said he will be. This means he will put together a solid 6 month campaign. Buck is running the show which means Matt will settle in a nice groove and the Bal offense will click this year. Expect Matt to surpass 22 HR, 90 RBI, and have a batting avg that battles .300. 1B-Freddie Freeman will be the next rookie sensation out of Atlanta. He will have little pressure to be the guy with Heyward, Chipper, McCann, and Uggla expected to be the run producers, so he can let his natural ability do the talking for him. I see him getting 25 HR with 100 rbi in his rookie campaign. 2B-Dustin Pedroia will struggle early to find his way with his new mechanical foot (it isn’t mechanical just has a screw in it). He will struggle in the first several months but will have one of the hottest bats for the month of July. He will crush 10 HR that month and end the season with 22 bombs, he will also regain some speed during the season, and the Red Sox will look similar to the speedy Rays. He will finish the season with 23 SB. SS-Alexei Ramirez will continue his hitting ways that he showed at the end of last season and be a near 30/30 candidate (probably a 27/26 to be exact). In his fourth full season, and at 29 I expect him to have it all rolling. It will help that the White Sox will have the best offense in the Bigs. 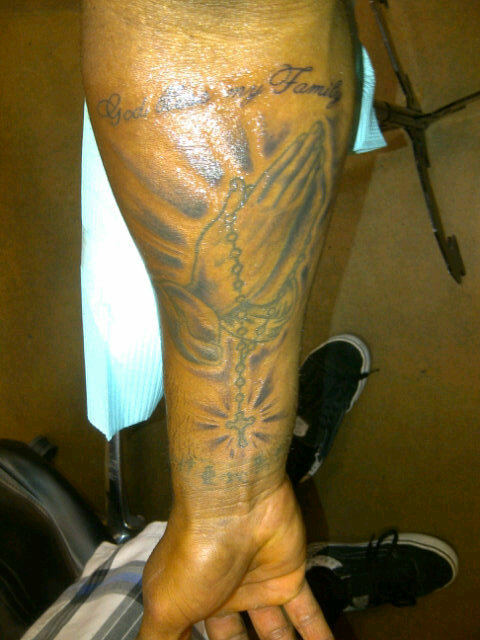 Kung Fu Panda's new Tat that will propel him to fantasy greatness. 3B-Pablo Sandoval the Kung Fu Panda will make his rookie season seem decent. He has a new slimmer build and a new tattoo that will propel him to the tops of the 3B rankings by season’s end. He will break the 90 R barrier drive in over 100 and have a solid 28 HR. Did I mention the tattoo will actually have him swiping 10 bases too. OF-Colby Rasmus will be the spark that helps drive Pujols’ career/contract year. Rasmus will be the CF that everyone hoped he would be winning his first gold glove to go along with a solid 30/20 campaign. He will be hitting in front of Holliday, Pujols, and Berkman so expect his R total to be near 100. OF-Andrew McCutchen has all the tools to be great and has gotten better every season. This is the year he leads the Pirates to the cusp of a .500 season. At the end of the season it won’t be because McCut didn’t carry his weight to the tune of .300, 25 HR, 85 RBI, and 30 SB. Will finish the year in the MVP voting as well. OF-Jayson Werth will look like a lost puppy without the friendly confines of Citizens Bank Park. He will struggle to get to 20 HR, and make his contract look worse than most have already said it is. A terrible .260 Batting Average won’t help his case either. Util-Adrian Beltre will again look like a greedy player with no drive when their isn’t an incentive to play for a contract. He will look like he is back in Safeco by season’s end. A .270 average with a measley 22 HR in the Rangers ballpark will leave Ranger fans, and his fantasy owners wanting more! Util-Alex Rios will make his SS’ season look miniscule. He has an outstanding year batting behind the bash brothers Dunn and Konerko, and when he isn’t hitting bombs to drive them in he will be slowly stealing his way to 33 SB. Which will look very good considering he will hit 25 HR and have 95 RBI. Util-Phillies Offense will look more than human this season. The league has started to catch up to their power hitting ways, Utley could be battling injuries all season, Werth is gone, Rollins is washed up, and Howard isn’t good enough to carry a team by himself. The Phillies offense finishes outside the top 5 in the NL. Util-Miguel Montero will look like the Catcher people were drafting last year. He has a great home ballpark to drive the ball all over the place and will end the year with a nice .285, 24 hr, and 80 RBI. Making him a top 5 fantasy catcher by season’s end. 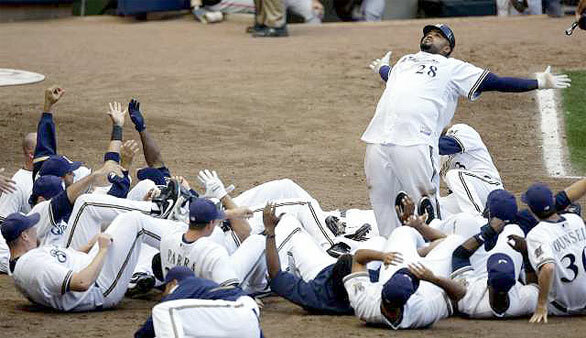 Util-Prince Fielder will try his best to make sure he gets top dollar come free agency time. He just seems like he would be the player who plays just a bit better when a new contract is on the line. Don’t be surprised by a 50 HR year from the Prince…oh yea and a .300 average to go along with it. Hello Paycheck! Mid Inf-Tsuyoshi Nishioka will have the 2nd best season of any 1st year Japanese player (behind the great Ichiro of course). He will hit right around .300, steal around 25 bases, with 100 runs scored. He will make the front office of the Twins again look like geniuses. Cor Inf-Kevin Youkilis will make his injury riddled 2010 a blip in his career radar. Regaining much of the ability he showed in season’s past, but having a little extra pop in his bat. 105, 35, 105 take that to the bank boys and girls. SP-Zach Greinke will show the world that his 2009 campaign was what he truly is. He will pitch like a man on a mission and slice through the NL like a Cutco through string cheese. He will finally have the feeling of 20 wins to go along with a sub 2.5 ERA. Not to shabby for a Brewer. SP-Brandon Morrow will sadly struggle through minor injuries all season and just won’t be able to reach that 180+ K’s everyone is banking on. In fact he will barely top 120 by season’s end. Since his injuries will add so much he won’t even see double digit W’s. That’s ok Morrow there is always next year. Timmy will be in many fantasy owner's dog house from his poor 2011 season. SP-Tim Lincecum won’t be considered Big Time Timmy Jim after this season. His struggles of last May and August will be more of the trend this year rather than the rare misstep by Timmy. 12 W and only 200 K’s will be what Tim has as his final line. Not bad numbers, but not a 2nd-4th round value. SP-Jeremy Hellickson will live up to the hype that the message boards are giving him. He won’t look like David Price of 2010, but will figure things out quickly and be the 2nd best pitcher on the Rays staff by season’s end. 15 W, sub 1.15 WHIP, and sub 3.25 ERA. SP-Max Scherzer say hello to the strikeout king of 2011. His K rate after his minor league stint last may was unreal over 9k/9 innings. With him continuing that trend and the competition he and Verlander will have for most strikeouts by a Detroit starter. Scherzer will barely beat out Verlander with a crazy 240 K’s. His WHIP will be 1.1 too. RP-Jason Motte will be thrust into the closer role when Franklin has a 5 game stretch that is just too much to bear even for Tony La Russa. He will graciously accept the job and never look back getting over 25 saves while raking up a nice 65 K’s. Motte will be the reason many fantasy owners win their league. RP-Daniel Bard will take the closer role from Papelbon. Paps struggled at times last season and when he has his hiccups this year, coach will call on the hard throwing Bard to take his place. 20 saves with 85 K’s will be Bard’s final tally. RP-Drew Storen will be this year’s version of Neftali Feliz. He will pitch extremely well for the Nats in the 9th and will reach the 40 save mark by season end (which will mean he helped close out more than half of their wins). He will strikeout 90 batters in the process. RP-Huston Street will quietly have a top 5 finish among fantasy closers. He will stay healthy for the entire year and will get batters out like it doesn’t require any effort. 45-50 saves with sub 2 ERA and sub 1 WHIP. These are by no means absolute truths, but don’t be surprised when I have predicted the future. Make your own Bold Predictions in the comment section below. If you’re a fan of the blog, “like” H2H Hombre on facebook, or “subscribe” so you get notified immediately when a new post is up. If you have any suggestions on how to make the blog different or better than the other fantasy resources out there don’t hesitate to let me know. I want this to be a site that you find helpful, funny, or both. Good luck to all of you as the season starts in less than 160 hours. Fantasy Baseball has finally arrived! Ryan Anderson (Orl-PF, C) Ryan Anderson has been on a tear for the last several weeks, and in Yahoo formats he is only 52% owned. Look at his line the last two weeks. FG% .484, FT% .824, 3’s 3.5, Pts 16.8. Reb 7.1, ast 0.5, stl 0.4 Blk 1.1, TO 0.9. So at first glance he offers help in every category except ast and stl, but offers huge benefits in both 3’s and has a great turnover rate. Come on people he needs to be owned by 75% or more. Rudy Fernadez (Por-SG) Rudy has been playing well for his 27 minutes a game. However he is owned by only 21% of leagues. So if you need a slight boost in 3’s, 1.5 a game, FT%, .882 a game, and Stl, 1.8 a game, then Rudy is your guy. However he will hurt your FG% considering he is shooting under .400 and only getting you 10 pts a game. 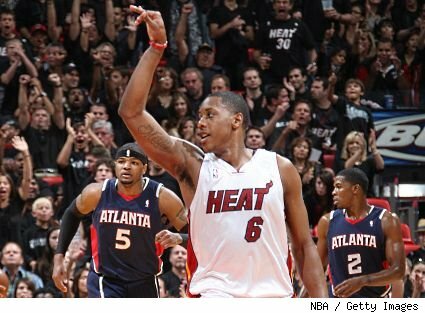 Mario Chalmers (Mia-PG) Mario was just named the starting PG again for Miami so his value gets a slight boost considering his Minutes per game are at 32 and might go up some. His value comes from his 3’s 2.8 a game, ast, 3.8 a game, and stl, 1.4. He doesn’t cripple you in any category considering he is a PG. You may be thinking 3.8 ast isn’t that good for a PG, and you are right, but he will probably get into the 4.5-5 range since he is the full time starter now. And ast is a difficult category to get help in at this point in the season, so every little bit helps. Greg Monroe (Det-PF, C) Monroe has been playing really well since the middle of December. It seems like this rookie is getting used to the pro game, and he is finding his role on the Pistons. He will be a good addition to your team if you have no depth at your C position and will boost your FG%, .643 a game, your rebounds, 8 a game, and is averaging less than a turnover a game. His FT% and low blocks are the only thing holding him back from being a must add in every league. But he is getting playing time 32 min per game, and the Pistons have been playing pretty well as of late. Roy Hibbert (Ind-C) Hibbert hasn’t even been close to averaging a double-double over the last month, and he is shooting a terrible .363 from the field. He is a center and is shooting under .400 and isn’t even shooting 3’s! He is only helping in Blks and he is only getting 1.2 a game. It is time to kiss Hibbert goodbye or at least try to see if someone else is willing to take him. O.J. Mayo (Mem-SG) Mayo is having a tough year his minutes have dropped since last year. He is shooting under .400 and is only at 1.2 3’s a game. This is low for a shooter, but then again his ppg is at 11.6. If he is on your team you can find those stats on the waiver wire. It’s time to say goodbye to Mayo. Unless Memphis trades him he isn’t worth much right now on your team. Green keep your eyes open so you will start hitting your shot. Jason Terry (Dal-PG, SG) Terry is someone who always has his ups and downs so I’m not going to say drop him right now, but if he continues to play as poorly the next 10 days as he has the last month, then you should drop him. He is shooting under .400 and under .620 from the FT line, and is offering little to no help in the D stats. So he is more of a wait and see but he should be the next to go unless he picks up his game the next couple of games. 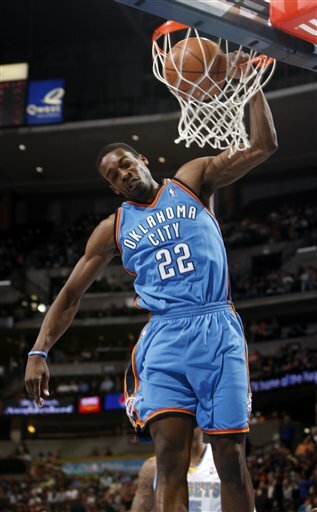 Jeff Green (OKC-SF, PF) Green was off to a career year for the first two months, but then something happened, he wasn’t making his shot. His minutes have actually decreased 3 min a game since November. This isn’t a huge decrease, but it could mean his minutes could continue to dip if he doesn’t find his shot. He is shooting poorly from both the field and the line. His 3’s are down and he isn’t even getting 5 reb a game anymore. It hurts me as a Thunder fan to say this, but Green is playing bad and watching him live you can tell he isn’t comfortable right now. Leave a comment if you agree, disagree, or would like some help with another player not listed here. Enjoy and don’t forget to answer the poll offered under the poll page. Good luck to you fellow fantasy players!